Nasir explains his experience at a local sandwich shop, Relish Fine Foods, and the guys speculate as to how the cafe is restricted from allowing customers to eat on the premises. NASIR: Welcome to our podcast where we coiver business in the news and add our legal twist. My name is Nasir Pasha. NASIR: And, this episode – I feel like I was about to go in a more formal introduction like, “In this episode, we’re going to talk about…” but when do we ever do that? MATT: Or maybe ever I guess. I don’t know if we have. NASIR: Yeah, just look at the title and people know what we’re talking about, whatever the title may be. MATT: This isn’t a TV show where you do a preview. NASIR: Yeah, an introduction or a preview and then they show clips of the podcast. MATT: Yes, some podcasts do have… ours aren’t long enough so it wouldn’t really make sense but some of them will have a line or two from the episode at the beginning. NASIR: Yeah, I remember Zero did that, I think, did they? I’m trying to remember. Or maybe they did it for the past episode. We should have an update from the last episode even though one episode has nothing to do with the other. MATT: We recorded two back-to-back. I don’t know how much of an update we could do from one to the other. NASIR: Well, we can give an update of what’s happened with that fundraiser on GoFundMe for the last story. They’ve raised $5.00 more. NASIR: Anyway, I guess I should start out with this, right? MATT: Yeah, this is all you. I can sit back on this one. NASIR: Okay. Well, don’t sit back too much because you’re the one who usually does the intro. Of course, then I look to my right and left and I see there were some tables there. There was never that much seating in the first place and there was a couple of tables there with chairs – like, high chairs, but those high chairs are gone – but then they have stools like at Starbucks or whatever, they have a bar on the window and they have a bunch of stools and I see a couple of people sitting there, eating, with their bags. So, of course, I’m confused. I overhear somebody, he’s like, “Oh, can we eat here?” “Yeah, we just have to pack it to go.” I was like, “Okay, that’s weird.” Then, I was like, “Oh, so you guys are moving?” They’re like, “Yeah, we’ve moving,” and they told me they were moving down… it’s actually not that close-by but relatively close-by. And then, I overhear them, “Yeah, we’re moving,” but it’s bad business on their part anyway. They’re referring to their landlord, basically. They’re basically moving out because of it. So, what are we talking about here? Obviously, there’s some kind of lease provision in this particular establishment. That’s why I was like, “Should we call this a restaurant or not?” because, somehow, they defined it that, okay, you can sell food here but you can’t have – I don’t know how they defined it because how you define these kind of restrictions are actually pretty specific – but somehow people aren’t supposed to go in there and eat at the premises. MATT: Obviously, you’re the one that’s been there. I haven’t but I think I found the right spot online. It looks like it’s just a free… I imagine his as in a strip mall or a joint to other spots. It looks like just a free-standing building with a restaurant or café or whatever you want to call it is. NASIR: It is a free-standing building. I’m just trying to think if there’s anything else attached to the building. But, definitely, when you walk in, it’s definitely whatever it is now doesn’t seem like what it used to be. In other words, it wasn’t designed to be a restaurant. it seems like there was something else there – some kind of store of some sort. It’s a very strange plaza, actually – not even a plaza. There’s some kind of wine bar restaurant next-door. MATT: It doesn’t even look like there’s a lot of space to eat there. NASIR: There’s not, and it’s always been like that. If you wanted to eat there, you can’t go during lunch because it’s going to be busy so you may have select room or whatever. But most people who seem to go there always it got it to go anyway so it was one of those kind of places anyway from the start. MATT: But, yeah, you told me about this and this was before I realized it was just a building by itself. At least I assumed there was like a grocery store or a supermarket nearby or something. Now, I’m even thrown for it because they said there was a provision in their lease. So, the one thing I can think of, well, it wouldn’t be an exclusivity provision because it wouldn’t be able to go up in the first place. And so, maybe there was some sort of prohibited use that they can’t eat there. They could sell food. 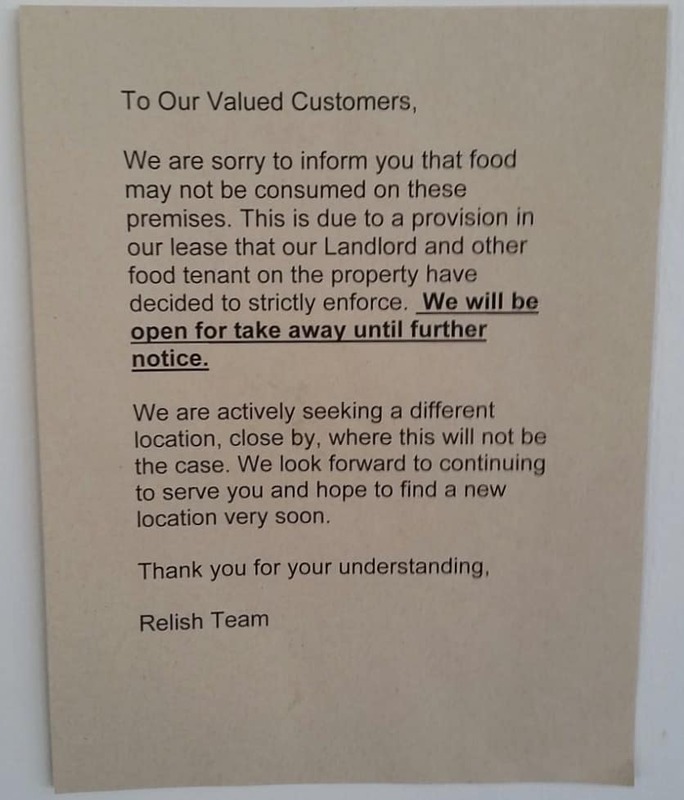 NASIR: It might be some sort of exclusivity because they do mention here – and I’ll read it again – “This is due to a provision in our lease that our landlord and other food tenants on the property have decided to strictly enforce.” And so, this is what I suspect just based upon very little information is that you may have some kind of lease provision which basically defines what use they may use. A lot of times, let’s say you’re a landlord or a tenant for that matter and you’re trying to draft your lease and maybe you only want so-called “nice restaurants” in there, but how are you going to define a nice restaurant? Often, what you’ll do is you’ll be like, “Okay, you can have a restaurant so long as there’s table cloths and there’s seating with these kinds of chairs and you have this number of seating and you don’t have a bar or you don’t have this. You have waitresses or waiters.” You put in those specific details and so there may have been something to that effect or it may have been just as simple as saying, you know, “No dine-in restaurants.” That’s a common term, too. Perhaps that’s always been in the lease and then the neighbors were like, “Hey, wait a minute. You know, we were supposed to be the only dine-in restaurant in the lease and now these guys have been operating.” That’s what weird – these guys have been operating like this for at least two or three years. MATT: Yeah, and I agree with you on that. There could be some exclusivity provision but it would have to be they can sell sandwiches or restaurant-type food but you just can’t consume it there. Usually, it’s the opposite of that – you can’t have off-premise consumption. There’s a restriction for that. NASIR: You have to have dine-in for X number of seating, et cetera. MATT: I mean, it’s like, is it a restriction against on-premise consumption? MATT: So, can I go sit in my car and eat it then at that point? The fact that it’s isolated by itself, there’s something that we don’t know about. I don’t know. MATT: Is that pasta they’re selling? NASIR: Yeah, they sell pasta and I think they may sell even – I may be wrong but maybe – wine. Probably not alcohol but they probably sell olive oil and things like that. You go in there today, there’s like five or six pieces of inventory each and I think that might be because they’re moving, possibly, and they’re dumping in the inventory. But, even in the beginning, it was very weird. By the way, it’s expensive and it’s pretty good but I wouldn’t be surprised if wherever they move to ends up being better for them anyway and it’s for the best of everyone’s efforts to get them out of there. 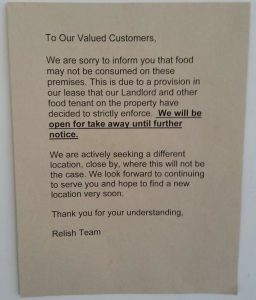 But what I think is obvious is, for the landlord to put this restriction on and for their co-tenant to put this, they knew that either Relish would have to go carry-out only or move, and they probably knew that carry-out only was not going to be the solution and the reality of this whole thing was to get them out because they wanted to replace the tenant with somebody else. MATT: Yeah. I mean, that’s my best guess as well. Once you saw that, you asked them to see the lease when you saw that, right? NASIR: The owner’s actually usually there and, when I went that day, the other day, it ended up being just two other employees that I’ve never seen before. It’s been months since I’ve been there so I have no idea how long this sign has been up, frankly. If the owner was there, I’d probably be more inclined to ask and maybe she’ll reach out to me or reach out to us and provide any comment after she hears this story. I’ll send it over or something but I did not reach out to her. I thought about it, though. MATT: So, there’s a couple of things in the note that they note and one was “we’re actively seeking a different location.” I guess that’ll be interesting to see what happens. I mean, I guess they’re going to have to break the lease and maybe that’s something the landlord is fine with or even, like you said, maybe that was the whole plan all along so that’s one aspect. Another thing that’s interesting that someone might think of is, well, they were doing it for years – you know, letting people eat there – what’s changed now? It’s in the note saying “due to a provision in our lease that our landlord and other food tenants on the property have decided to strictly enforce,” usually, there is some clause – it’s got to be in these long leases that are way too long – about waiver that, you know, essentially, because a landlord allowed this to happen for however many years doesn’t mean that they’ve waived their right to then enforce it. NASIR: That’s a great point, Matt. That’s a standard clause in there that is in the protection of the landlord because, otherwise, you know, these leases are so long, if the landlord forgets to enforce a certain rule or regulation or clause within their lease, then they don’t want to have the risk of waiving it so, yeah, that’s a great point. MATT: This should be interesting. I mean, I still want to know what this provision was. It has to be they’re only allowed to sell. Like, you’re not a grocery store. They’re not selling products to then go cook. You’re selling products that’s ready to eat. There’s probably some term for that. NASIR: Yeah, and I don’t know what happened. Like, what happened back in 2011 or 2012? Like, how did the landlord think that they were supposed to operate? Was this provision just stuck into the lease that no one even realized was there and then the landlord conveniently used later? Makes you wonder, right? MATT: Like we said, there’s not a lot of space in there to eat as is. You’re right; those tables are extremely thin or narrow. NASIR: Yeah, and I kind of understand, obviously, within the letter that they posted, there’s obvious frustration from the owner, you know? It’s apparent and it’s probably understandable. Here, they’re running a business after many years and, all of a sudden, the rules are changing, you know? That’s not cool. MATT: I’ll tell you what, though. I mean, I’ve never been here – probably will never go – but it looks pretty good. NASIR: I think it’s the concept of they try to serve slow food, whatever that may mean. MATT: Slow food? As opposed to fast food? NASIR: No, it’s the concept of like, what do they call it? Slow carbs or low carbs or something to that effect but a lot of fresh vegetables and fresh ingredients. They didn’t have it when I was there; they had all these salads. MATT: I don’t know if it’s low-carb if they have all these… I mean, bread is carbs. NASIR: Sandwich, yeah, they have sandwiches. MATT: I’m looking at a photo that is just loaves of bread on top and a ton of cookies underneath. NASIR: Well, let’s see. I don’t know. Let’s see, they’re a member of Slow Food USA. “Relish supports the slow food movement, obtains the freshest ingredients through local producers.” Oh, okay, maybe how they get their… how they source their ingredients and stuff like that. MATT: Farm to table or whatever that is? MATT: When you said “slow food,” I thought you meant like, you know, handcrafted artisan sandwiches, things like that. NASIR: Yeah, and then they ended up taking a long time to make it which is frustrating. MATT: Well, I mean, this isn’t McDonald’s, you know. It’s not fast food. Maybe that’s what it is. The sandwiches aren’t sitting there beforehand so everything is made to order. That’s my guess. MATT: So, when you move to another location, you’re going to lose some business just in the move right now. NASIR: Oh, yeah, especially restaurants, absolutely. But, like I said, if you guys know Houston, it’s like Westheimer and east of where they’re at now and they’re on San Felipe now. And so, I still think wherever they go, they’ll probably end up being in a better place, but we’ll see. MATT: I’ll tell you what, though. These photos look pretty good. How far is it from your office? NASIR: It’s like a couple of minutes. MATT: Oh, okay. Well, if I ever come out that way – well, we’ll have to go to the new location. Hopefully, it’s still around. NASIR: It’s going to be a little further. NASIR: For a take-home, I mean, this is pretty basic. That’s what’s a little sad about this and I don’t want to over-criticize because, obviously, they’re a local restaurant and I’m sure they had a lawyer review the lease – maybe, maybe not, I don’t know. MATT: You might want to be sure. NASIR: Yeah, I know, I should be sure. But this is a pretty basic provision to look at as far as the use and that’s the first question you ask. I’m reviewing a lease right now and one of the first things I saw on the first page it said, like, “Permitted to use financial institution,” and that was a typo. It’s going to be used for a completely different purpose but what they put in there is so important because, if they don’t comply with that permitted use, then it could be a breach of the lease and, if there’s other regulations – and usually it’s in exhibits and towards the back of the lease where it says, you know, “There’s a Subway next-door so therefore you can’t do deli sandwiches,” you know and there’ll be a restriction for that – and that’s something a lawyer and a real estate and a lease broker, if you have one which most people don’t, at the least, they’ll be able to point that out, but definitely an attorney would be able to spot that out right away. MATT: Well, I mean, it’s possible that they just overlooked it or they missed it all together. Even if that’s the case, it’s possible that the landlord didn’t know really either and they said , “We have this huge tenant that’s coming and we just need to find a way to get them out of there,” But it could have been the case where the tenant did notice that in there and did see it and said, “Well, this is just a good opportunity for us,” and maybe it was kind of a handshake agreement that it won’t be enforced and now it’s coming back to get them. NASIR: Exactly, and that’ll happen, too. You know, everyone’s rushing to get the lease done or whatever and they’re like, “Oh, don’t worry about that, that’s never going to come up,” right? And just to make it applicable today. I was dealing with a land closing today of a provision in a deed that everyone knew didn’t matter but it’s that one out of a hundred times just in case and imagine Relish Fine Foods now is I would imagine, in the short-term at least, this is costing tens of thousands of dollars – you know, whether you have to close and move and all these ancillary costs to it. Hopefully, they’ll make it up and I’m sure they’ll do well in their new location. But imagine if this could have been prevented? And, assuming it could have been prevented, it was something not malicious or something like that that a lawyer could have discovered this and, you know, prevented that, how much would that have cost, you know? MATT: Yeah, it reminded me, you’ve seen Super Troopers, right? NASIR: Yeah. In fact, they raised enough money to do a next one, right? NASIR: They’re shooting it? Okay. MATT: Yeah, they’ve already shot part of it and, when you said that, it reminded me of the scene where they’re at the gun range and he takes down the thing and all the bullets are in the chest or whatever or where the chest protector would be and there’s one bullet right in the neck. He’s like, “What about that one?” He’s like, “That one? I wouldn’t worry about that one,” because he’s going to shoot the real-life target of one of them. NASIR: Just one straight bullet, don’t worry about it. Okay. Well, I was thinking about reaching out to these guys but, you know, I didn’t think they would feel comfortable talking about that stuff which is understandable. MATT: Yeah, they probably wouldn’t – I mean, they probably shouldn’t. NASIR: Yeah. But, when they do move in their new location, we’ll look out for it and we’ll try to do a quick plug for them as well. MATT: Yeah, I’m interested to find out more about this. I’ll really relish that opportunity. NASIR: Oh, well, you know, they’re going to appreciate that – a lot. They’re probably going to be the only ones though because I think everyone else is gagging from the pun. MATT: Starting off 2016 – one pun per week. We’ll see if we can keep it up. NASIR: Can you just get 52 out of the way and just get the average down? MATT: We record a whole episode where I don’t provide any substance, just 52 puns. NASIR: Ah, all right, well, thanks for joining us. Don’t Sign That Commercial Lease!